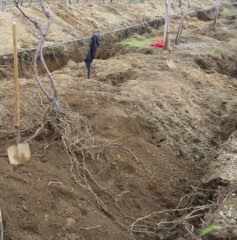 The soils in a vineyard provide two of the critical needs of all plants - water and mineral nutrients. Without proper soil management, grapevines are unable to adequately supply themselves with these critical elements for growth and development, which can compromise the quality of the fruit and the long-term sustainability of the vineyard. By understanding what the soil is capable of providing, and the vines' ability to tap into those resources, growers can make decisions about the need to supply nutrients and water to the vines. Final Report to the NY Wine & Grape Foundation and Viticulture Consortium-East on research conducted by Dr. Lailiang Cheng and Dr. Terry Bates on the seasonal uptake and distribution patterns of nitrogen in Concord grapevines. This work provided a more thorough understanding on the dynamics of nitrogen use by grapevines, especially about the timing and importance of different sources of N for grapevine growth and development. This research has led to updated recommendations on the timing of application of N fertilizers and on the amount that is needed by most vineyards. This has led to a reduction of the amount of supplemental nitrogen fertilizer applied in many vineyards in New York, which has had a positive impact on grower profitability and environmental sustainability.